Scream around the circuit in the lightning-fast 24 Hours Race Car! This robust, immaculately detailed LEGO® Technic model has all the features of a real-life race car, including a detailed V8 engine with moving pistons, opening gull-wing doors, all-round independent suspension, working front steering, high fenders and an opening front trunk and engine hood. Put on your racing gloves and step on the gas! Upgrade with the 8293 Power Functions motor set (not supplied) and you have bright LED headlights plus motorized gull wing doors and engine cover. This 2-in-1 model rebuilds into a SUV Racer. Price is 64% above the initial Lego retail price! This comes down to 14.77 cent per brick. 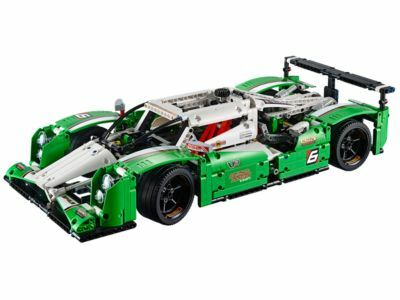 The 24 Hours Race Car (42039) Lego set is no longer directly available from the sites below. However, 3rd party partners of these sites might still have the set available. Alternate description The LEGO® Technic 24 Hours Race Car features opening gull-wing doors and engine hood, V8 engine with moving pistons and all-round suspension. Upgrade with the 8293 LEGO® Power Functions set for working LED headlight plus motorized gull-wing doors and engine hood.